Happy Halloween! There was an update this past Saturday and you can find the details in this earlier post. Dracula-X (SNES) 8×16 font added to the screenstyles that use them. 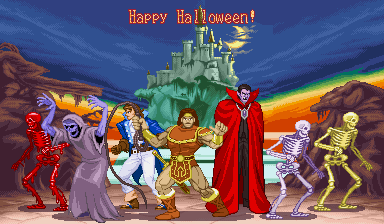 Konami: Simon Belmont (new sprite), Dracula (new sprites), Richter Belmont (updated sprite), Castlevania monsters (CV1 Zombie sprite added), Skeletons (with 3 variations). Custom Sprites – All these new sprites were added to the Castlevania section of the Konami page. This year marks the 25th Anniversary of Konami’s Castlevania hitting U.S. shores and invading unsuspecting NES systems around the country. With that in mind, this pre-Halloween update is really heavy with Dracula’s minions along with a Belmont to destroy them. 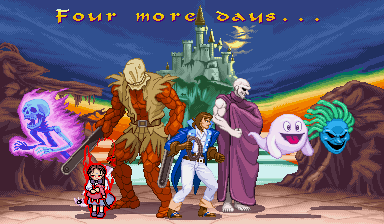 Non-Castlevania fans still have some things to look forward to as other horror and monster-related sprites and things haunt this update. An expanded version of my scratch-made Castlevania cover art recreation was added to the 384×224 Create-a-Scene screenstyles. You probably figured that out from the main screenshot, though. More Darkstalker backgrounds were added to those, too. Expect a few more items to be added on Halloween day! Here’s a little wake-up call to let you know that the site has been unpaused. GFX Generators – The huge Capcom character section was split up into multiple areas to make things a bit more clear. More MSH backgrounds were added to most of the variable background screenstyles. 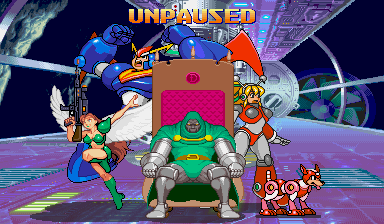 Sprite Rips – All 100 CD portraits from both Megaman & Bass (GBA) and Rockman & Forte (Super Famicom) are now in downloadable .ZIP files. Each is a separate .PNG and all have the same alignment according to where they are on the screen. Game Index – Alien Syndrome (arcade), Contra (NES), Mega Man (NES), Shinobi (arcade), Xenophobe (arcade) added. Game Logos – Alien Syndrome (arcade, including an animated one), Devil World (arcade, added to Dark Adventure section), Gun.Smoke (arcade and NES), Kung Fu Kid (SMS), Rainbow Islands (arcade), Rastan Saga (arcade), Solomon’s Key, Super Dodge Ball (arcade), Wardner (World and Japan arcade versions), Xenophobe (arcade) added. Mini-Logos – Xenophobe added to Atari-Midway-Williams section. There will be a small horror and monster-related update around Halloween.